Please explain what the hell those construction workers are trying to accomplish on East Thomas. We moved here on the day it was 122 degrees. They were working on it then, and over six months later they are still digging up and patching over the pavement in front of our building. The amazing thing of it all is that the bulldozers, jackhammers and that “beep-beep” sound of heavy equipment in ‘reverse’ starts around 10 p.m. and usually stops at the same time my alarm goes off in the morning (it’s not the same every day). I’m sure that whatever they are doing, it is important. But what could take so long? I remember one summer my mother, sister, and myself lived in a small trailer for two months. My father drove a Cat for a construction company. They built a reservoir in those two months. Anyway, we’ll be leaving Phoenix in a few weeks. I’ll always remember that road. If you ever find out the answers, let me know! For purposes of stealing catchy food-related terms such as “flavorful,” “evocative” and “stinky”, I make it a point to regularly read lots of restaurant reviews and food columns from around the country. I also keep track of job openings this way. So far as I can tell, there aren’t too many food writers who get letters about road repair. I feel obligated to respond. Melissa, these construction workers are tearing up and rebuilding Thomas Road at the personal request of of New Times columnist Tom Fitzpatrick. This is little known, but true. So you see, their work is very important. About three years ago, Fitz, who resides in the area, was out for his morning walk when he noticed a slight traffic back-up along Thomas. Deeply concerned about the emotional impact of such vehicular stress on the city’s commuters, the columnist returned to his home and called Terry Goddard, whose political career at the time still existed. I seem to recall that he was mayor. Goddard, of course, complied immediately. Such is the power of the press. Like most savvy motorists, I haven’t driven on Thomas Road since about 1987. One of my favorite alternate routes is Indian School Road, because it invariably takes me past the Chicago Hamburger Company. 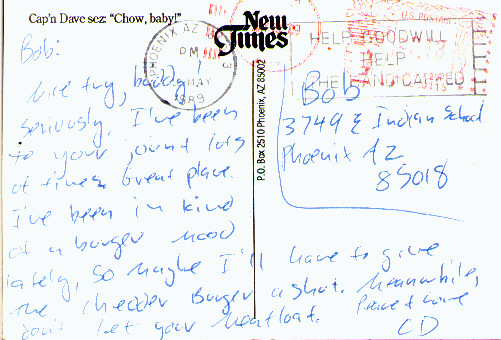 Bob, making a little joke, infers here that I used his ten-spot to review food at a competing restaurant. I only wish that I had thought of it. Anyway, Bob’s campaign ultimately succeeded, because I broke down last week and went in. The food is wonderful, doggone it, and I feel just stinky for waiting so long to heap free publicity on the place. Bob’s $10 covered the meal, easy. In fact, I owe him about $3.50 in change. I had an Italian beef, a double slider with cheese, and fries. The beef was very juicy and very beefy. Also very flavorful. The slider was rather evocative of a White Castle buger – small and slippery, served on a featherweight bun. These units, served alongside real food, tend to resemble items of rectangular garnish. They are inhaled, not eaten. Until my meal at Bob’s, I had never eaten a slider while the sun was out. The fries were fine. The usual Chicago-related sports mess hangs along the walls here. I recommend it anyway. The Chicago Hamburger Company is located at 3749 East Indian School.